For an overview of Asian banjos, see the Asian Banjos page. This page has the listing of inexpensive instruments only, the better quality banjos are described on other pages (see yellow menu above). This basic list came from Wayne Norman. I've added to it and commented on some of the banjos I have seen. These are the general features found in the entry and advanced amateur banjo brands. Cataloging these totally is probably an impossible task, but I'll take an initial shot at it. There will always be exceptions. The notations of style are mine, picked with the hope that gradually I can define more of the specific instruments. The wood is usually some fairly rapid growing tropical hardwood like Philippine mahogany, Nato, and the such. Exceptions do exist. There are about five categories of pot construction. 1- Wood pot, shoes bolted through the pot, head rests on wood or on a round metal ring. 2- Wood pot, shoes bolted through the pot, cast or tubular tone ring. 3- Aluminum pot, shoes bolted through the pot, straight sides, archtop or flathead. 4- Aluminum pot, flange cast into pot so the hooks go through it, flathead. Example is an unmodified mid 70's Alegretto banjo. BT - Straight through banjo tuners, offset or planetary. ATR - American type resonator, fairly thin wall, solid construction. May have inlay, fancy purfling. 13 5/8" dia. KR - 14" thick sidewall (Korean) resonator. Mates to Gibson size flange, tight fit in banjo cases. This also appears on early Japanese banjos like Aria, Ventura, and the tooling was probably sold to the Koreans who continue to use it to this day (sadly IMO). SOR - Spin on, same size as pot. Some other nifty features encountered are veneer overlay on the fingerboard, painted on binding, color in finish only including binding like a plastic overlay, welded steel tension hoops, cheap steel tailpieces, wooden armrests, and the neck held on with a single eye bolt set into the neck heel and screwed into a big cadmium plated coordinator rod nut. Any of these names may be encountered on higher quality banjos....or other instruments. Allegretto - 4, GT, bow tie peghead, square block inlays, metal tuner buttons, shown as example for type 4 integral flange aluminum pot above. Andrews - These are NOT the banjos currently made by the Andrews Banjo Company of Napa, California, email: to . These domestic banjos are quality instruments; Mr. Andrews makes all the wood parts, cuts and inlays all the pearl and abalone, and makes all the tone rings and coordinator rods. Almost no one makes these parts themselves, so these are certainly true custom instruments. That the names are the same is coincidence, the difference in quality is obvious. Antoria - Samick brand name from August 2002 on in UK, earlier us exists but source unknown. Aria - Full line of banjos from Al pot entry level to Masterclones. Ashbury - Current, Korean, marketed at least by Hobgoblin Music, UK. Also a masterclone is available. Austin - entry instrument, recent, Elderly had these. Bently - St. Louis Music Co., low end brand, they kept no records. Blue Ridge - A Saga brand. I don't know if there were any better quality ones. Booringwood - current, looks like Samick built, brand of Gortin Music Wholesale, Co. Tyrone, N. Ireland. Aluminum pot. Canora - like Samick SB5 in general appearance, seen in tenor in Australia, and basic 5 string n New Zealand. Conn - The organ company? Dakota - 4, BT, KR rosewood with eagle on back, block inlays, unique headstock shape and inlay. Danville - 1, GT, KR, Gold Tone shape headstock on maple neck like some entry Johnsons, probably with cosmetic flaws covered with sunburst finish here, Mahogany 14" reso. Seen on eBay. Also 4, GT, KR. Epiphone (import) - Gibson marketed, looks like a Samick/Daewoo Korean combination product. MB200 is aluminum pot with resonator. Gamma - 4, BT, KR, eagle decals on reso inside and out, Korean made, block inlays. Gitano - 1, GT (crooked on new eBay sample), CR, supposedly beech neck (odd, not a SE Asian wood), dots. Greg Bennett - current, has a Samick like tone ring model also. Gremlin - rebranded Ashbury Aug 2002 on in the UK. Gold Tone - assembled in the USA using a large portion of Asian parts. Very full line, see the OB250. Ibanez - Full line of banjos, including nice ones. See link to page 2, top of the page above. Iida - Full line of banjos from Al pot entry level to masterclones, including Korean in the 1990's. Current models include the 230 and 230T (tenor) with H&F, shoes and brackets, resos. See link to page 2, top of the page above. JB Player & JBP - JB550 - Current, BT, 4, KR (? ), original inlay, maple neck (a surprise). 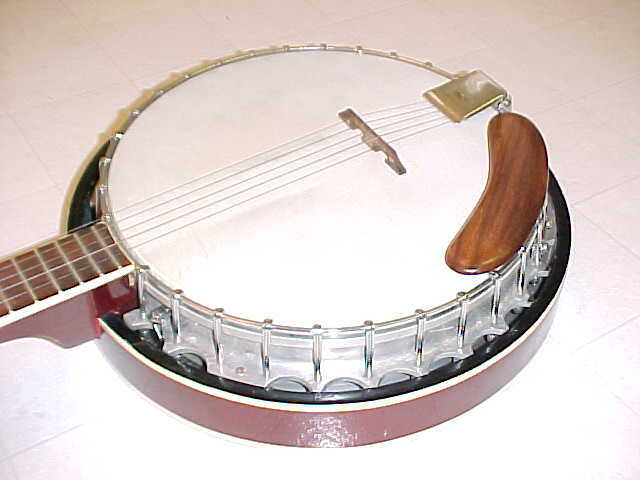 At the 2002 NAMM trade show, I found this banjo. It had hung on the importer's booth for 3 days at that point, and was still un-tuned, the strings were slack. They must really care. Kasuga - there were nice mandolins in this product line, similar to Ibanez ones. --- were there any nice banjos? Kawai - stencil brand, presumably for the piano company. Japanese, 60's, seen with small resonator, solid bridge, and tailpiece like the cheap Stella guitars of the 50/60's. Early in the Japanese learning curve. Kay - Probably Korean (3 screw truss rod cover), with the circled 'K" logo like the domestic ones. 4- GT. Also seen on eBay, a very fancy Alvarez built one from the rarely 70's, with the wide edge resonator with marquetry on BOTH the top and bottom, mirror image, eagle on back, 4 gold guitar tuners, rosewood reso, multi ply built up blonde neck, circled logo, and a warranty card referring to Kay Instrument Sales in Chicago. This would seem to be right near the end of domestic production for CMI (Kay, Stella, Harmony, some Regal) which ended in 1974. Kay - current - KBJ100 "Golden Liberty" - gold plated, hearts and flowers, black drumhead, but still 4, GT, KR......ie the same thing that has been made as a marginal entry banjo since the '70's, gussied up.......like the pix at the top of the page. Kona - KPRB200 current, ?, GT, CR, 3 plates to reso. Lero - I have now seen one of these; it really does say Lero and not Leroy. 3, GT, CR, 3 plates to the resonator. Morgan Monroe - Korean, current. MCB-1 has an aluminum pot. See quality list for other models. Oscar Schmidt (import) - current, aluminum pot, h&f, a bit above entry level. Palmer - PBJ53 4 GT (enclosed Gotoh) KR blonde, eagle decals inside and out, clear head to show inner one. Pedro Martinez - Early 80's in Italia, see also the other page. DX 61, with integral aluminum flathead rim/tone ring cast as it were a full-sleeve archtop tone ring, save that the inner rim would not raise the head, resting instead a hair width below it, thus creating an effective resonance air chamber. Probably the same as the C. F. Mountain pot described above. Hex bracket shoes, block inlays. Stamped Iida patent. Pirles - 3, GT, CR, seen in tenor. Ranier - early 70's like Alvarez resonator, thick wall, reddish/ black rosewood, marquetry, eagle decal inside, looks like eagle inlay outside of reso but could be a decal under the finish, 4 PT, pretty flashy, still a modest instrument. Seen on eBay. Wayne Norman recently bought one of these banjos and wrote this about it. Pretty interesting. "There has been one banjo (of many) on eBay for the past few months called "Rover." It looked pretty good on the screen, so what the hay...I bought one for a little over a hundred bucks. Came with a nice gig bag. "It's pretty well made, the rim is a little different from the Harmony Res-O-Tone, having a small flange for the hooks. The neck is quite good, rosewood FB, guitar tuners, good frets and binding, and very well (Gibson) shaped. Has a real working 2-way truss rod. The action is very good. 5/8" bridge and No-Knot TP, and Vega hot dog arm rest. Neck is mounted via 2 lag screws, with a single co-rod. "BUT, the tone was pitiful for a clawhammer banjo. It came with a Remo head, the new thin one, in high crown. The tension hoop is thick, but not too high, so it was way down past the top. No matter what I did it still sounded lousy. Tried different strings, bridges, head tension up and down the range. "Then I put on one of the new Gold Tone GTS pre-mounted skin heads ($40-$50 - ed). It comes in low crown so it fit right. The tension hook nuts dug into the plastic flange, so I put small (#6) washers under the nuts and it works better. "The tone now is amazing. It has that old timey thin wood rim tone. The Gold Tone head resurrected this banjo. I have to say it is a pleasure to play. The head has remained nice and tight and shows no signs of humidity sensitivity." About a year ago I saw something in the Interstate Drum catalog. Remo introduced a new drum head called Renaissance. It looks like the old high quality near-clear calfskin heads rarely seen today. The only banjo size was a 12". I had built a 12" deep-rim banjo with a Tony Pass block pot. I finally got around to putting it on, and was very impressed with the brilliance and depth of tone it produced. Now Ramsey is using them on his 12" model, and had Remo make it with a banjo size collar and crown height and in 11" also. Donald Zepp and Elderly now carry them, and I got some 11". I took the skin head off the Rover and put this on. What a tone. It's somewhere between a regular Remo and a Fiberskyn3. The clarity of notes is what makes it different. Easy to get different tone from it by adjusting head tension. So Wayne got a frailing banjo that is a pleasure to play for about US$150. Damn good deal, although bear in mind this is a rock bottom price he found. A much more likely overall price is around $200, all up, with the opportunity to have the instrument in your hands and assess it at your local music store before parting with cash. RB30, RB35, RB40, RB45. Built on cast aluminum pot in various degrees of embellishment. The RB45 can be set up to be very nice sounding. Current production. Saga - Presently have entry level and travel banjos only. The present Saga Style III is very similar to the kit except the Style III has the present common thick wall (Korean) resonator, a bound fingerboard and nice tuners. It looks like the cast in archtop is still there, but machined below the surface of the head to create a flathead. I have seen this conversion on a C. F. Mountain. At a street price of around $400, this is a pretty good workhorse. Samick - Sam Ick company, Korea, builders of about 1/2 of the world's guitars in 1999. Will put your brand on. Customers include Gibson (Epiphone), Washburn, Oscar Schmidt, etc. Daewoo (like the car) is the other major Korean supplier of hardware. Sigma - C.F. Martin import brand, late 70's, 80's. Guitars, mandolins too. St George - very early Japanese banjo brought in by Tony George of Troy, NY. He claimed to have been to Japan to teach them how to build guitars. Crusty Armenian, he ran George's Music in Troy where I went to college. It is where I bought my first (no name) Japanese banjo for $22. & also my first Martin. Tradition - Not the same as the Tradition banjos made in the San Fernando Valley in the 60's. Washburn (import) - current, aluminum pot, h&f, a bit above entry level. Similar to Oscar Schmidt. B16 is a tone ring/ flange model, see above. Westminster - Takamine/Coast Music brand?